Talking Low Vision Count Down Timer - Silver - This talking timer makes cooking or baking a breeze! Ideal for those with vision impairments, this low vision talking timer is easy to use and practical. Voice guidance helps you set it, and a combination beep/announcement gives you an audible indication when the set time has expired! 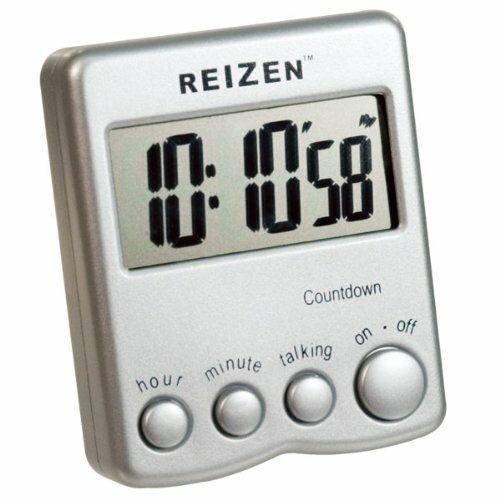 This Talking Low Vision Count Down Timer counts down hours, minutes and seconds on its LCD display. The low vision talking timer also features hour and minute digits, measuring 0.75 in. high. Second digits measure 0.50 in. high. Maximum countdown time is 23 hours, 59 minutes. Voice guidance assists user in setting timer. Beep alarm and 'Time is up' announcement upon expiration of time. Alarm time remaining announced at the touch of a button. Uses 2 AAA batteries (not included). 90-day mfg. limited warranty.